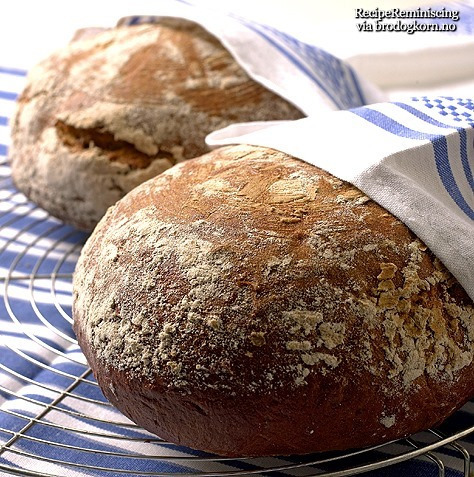 Norwegian Barley Bread recipe- says to soak barley grains overnight before adding to poolish. Does that mean the whole grain with the husk?? Or does it mean hulled barley or pearl barley??? I know that hulled barley is more nutritious than pearl barley. but my personal preference would be for hulled barley over pearled barley. Better nutritionally, as you mention, and more flavorful. Thanks. I will have to order barley grains or hulled barley online. I can only find processed pearl barley locally. If I used hulled barley, would I crush it in the food processor or leave it whole? This is all the recipe said..." Start by setting 50 g of barley grains to soak overnight." I cant find the website to clarify. Hi Patti Y not sure if you have home brew shops in your part of the world as we do here in Australia but they are a great source of grains that serious home brewers like to incorporate in their brews. i have been able to get malted rye flakes as well as whole rye berries. Barley is brewers favorite grain! That makes sense...no point in crushing it. So I need to look for whole kernels of barley. Thanks. Could you post the recipe or point us to it, please? That would give us a better sense of what you are dealing with. And I found this comment on the same site, but different page... "A juicy and rustic barley bread that tastes good, is healthy, and keeps very well. Start by setting 1,75 oz./ 50g of barley grains to soak overnight." Stir the barley flour into the water. 1,55 lb. / 700 g flour. ( AP flour? Bread flour? Barley flour? I think it needs wheat flour to rise, right? Barley grains means the whole grain, right? It has not been processed in any way? Do I just look for barley grains or could it be called something else? The recipe page actually begins with Step 2, although it isn’t identified as such. The preceding page (that you noticed) has the directions for the softened barley grains required for Dough 1. So, yes, those would be the whole barley kernels. Since they don’t specify anything about the barley grains, I would assume hulled barley instead of pearled barley. I think you are on the right track in assuming that Dough 1 uses barley flour and Dough 2 uses bread flour. That should be a tasty, if rather heavy, bread. I agree, but the picture was so pretty! Will bread flour make it more dense than AP flour? Thanks. The barley flour will contribute to the heaviness, since it lacks gluten. That's why bread flour is specified; it contains more gluten than AP flour and will produce a loftier loaf. It wouldn’t surprise me if the bread is also more crumbly than an all-wheat bread, also because of barley's lack of gluten. The flavor should make the bread worth the effort, though. And, if you find it too dense or too crumbly for your liking, lower the barley flour fraction while increasing the bread flour fraction in the formula until you get what you want. As soon as I find some barley grains I will make it. I drove 2 hours to look for some at an organic food store, but no success.